I’m not sure if we are official but we’ve been getting away with it! Music and football go hand-in-hand as we prove on a weekly basis on Soccer AM, nearly as much as Rocket and Taking One for the Team. Add into the mixture the World Cup and your day job and you’re basically in heaven… if you’re world renowned DJ Norman Cook that is! 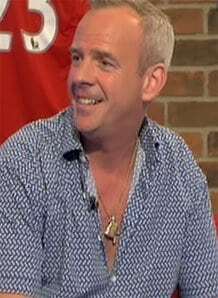 The man behind Fatboy Slim, Norman’s blend of house, funk, hip-hop, electro and techno has had the masses moving to his music for almost two decades now, and this summer he’s planning to entertain the England fans in South Africa. “I am the semi-official FA, official DJ of the World Cup!” he told Soccer AM. “So I did a t-shirt saying ‘Fatboy Slim official DJ of the World Cup’, because you can have the official beer and the official chewing gum. “Then at all the games the FA people kept coming up and offering us tickets to Ireland games and Japan games and after a while I said; ‘it’s really kind of you’ and they said ‘ well you are our official DJ’! “I’m not sure if we are official but we’ve been getting away with it! “The basic gist is; I go and play a gig either the night before or the night after the England games and it gives the England fans something to do when they’re there and this time we’re doing six shows and six games at the World Cup. “We’re playing Rockness then flying out, so we miss the first England game, but we’re seeing Brazil, Spain, Holland and the other two England games. When he’s not spinning his decks in front of crowds of tens of thousands, Norman can be seen on the terraces at Brighton, where he is also a shareholder. The south-coast club are currently sitting comfortably in mid-table in League One and Norman admitted he couldn’t be happier with the way the season has gone. He said: “Mid-table is really good for us. We’re normally at the top or the bottom, usually at the bottom so we’re really happy at being gloriously mid-table. As well as being ‘gloriously’ in mid-table the club have a new home to look forward to as they prepare to leave the Withdean for the Falmer Stadium. And Norman revealed he was excited by the prospect of seeing the Seagulls in their new surroundings. He continued: “We’ve been homeless for well over 10 years, but we’ve got a lovely new stadium which is flourishing and growing and it’s great because every time you drive by it it’s got bigger!